It is not unusual for cat owners to complain about their furry friend attacking them while petting, or for no reason at all. Several questions have been asked about why my cat keeps biting me for no reason. In fact, one very important detail cat parents often fail to remember is that cats are naturally predators and they possess the urge to stalk and pounce sometimes despite being domesticated. Kittens are naturally playful creatures, biting and scratching are normal behaviors they exhibit and are part of their early development phase. They tend to cultivate the right and proper behavior during interaction with their mother or kitten siblings. During this process, they learn how to play softly with their paws without causing harm. However, lots of kittens get adopted before concluding this very important phase of their life, and now the mantle falls on the owner to teach and train them right. Regardless of the fact that all cats (old and young) love to play, lots of pet parents still complain that their cat keeps biting them for no reason. Perhaps you were both having a good time seeing a blockbuster movie at the comfort of your home, and then out of the blue an odd feeling creeps in and next you see yourself screaming out loud after being bitten or clawed. First, allowing your kitten play with your hand is a no-no, if you’re guilty of this it’s high time you stop because you’re encouraging your feline friend to see your hand as a toy which might turn out very bad when he’s fully grown. This can also result to a cat bite infection, cat scratch fever, or rabies if left untreated. Secondly, that odd feeling that crept in moments ago while you two were supposedly having fun is called petting induced aggression. Usually, there are signs displayed when he’s had enough, they include dilated pupils, flattened ears, or a flicking tail. The point is, cats don’t bite without a reason and in order to quit this habit, you have to identify the factors responsible. Though they might appear to be cute and harmless, they do possess razor sharp teeth they could attack you with, and if not taken properly care of could lead to cat bite infection. Below are some of the reasons cats bite. Just like humans, your furry pal could get bored and we all know how awful that feels. Let’s leave that for another day. The point is, when your cat doesn’t get enough exercise, has no fun toy to play with, no post to scratch, or stuffed animal to hunt, he gets bored. Sometimes cat bites for attention, and with all that stuffed energy he could lash out by biting you to let off some frustration. 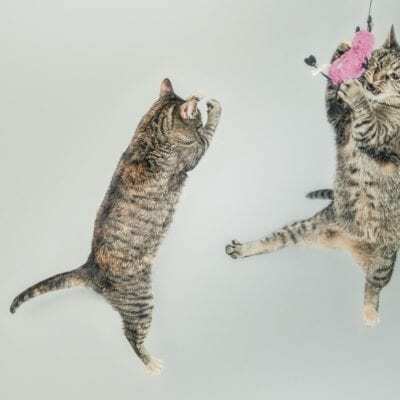 When your cat does this, hitting him or dropping him too hardly on the floor isn’t the best way to go about it, instead you should endeavor to play with your cat when you’re less busy as this could remedy this situation. When you’re busy working on something really important that you can’t play, or you’re away for work, leave him with some fun toys to play with. Make sure you have them checked for safety before leaving him to play with them. Kittens love to play with their littermates and during the course of play they scratch and bite. If one kittens bites too hard, the other strikes back or simply refuses to continue playing. By reacting this way, he learns not to paly too rough or bite too hard. However, most kittens do not get to spend much time with their parents or littermates to learn how to gain control and avert this behavior. Most times as humans, our personality depends on hereditary traits. We have the cool-headed people, the aggressive people, the introverts, extroverts, etc. same thing applies to our feline companions. 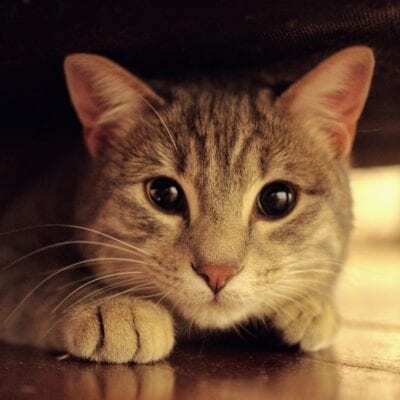 It is true that most times cat bites for attention, but their signs of aggression might be due to personality traits. A recent study shows that kittens are likely to become aggressive cats if their father has an aggressive trait. So your cat might be exhibiting this kind of behavior because of this factor. At this point you’re already aware that a cat could easily get irritated or provoked. Without having the slightest idea that kitty doesn’t feel the same way, you might want to cuddle, pet, or play with your feline pal only for him to bite you as a way of asking to be left alone. Don’t get me wrong, they are simply irresistible to play with, and with so much energy they will surely reciprocate. But sometimes, they don’t just want to be bothered. Your mood will definitely reflect in the way your cat reacts. Naturally, they are sensitive creatures and will respond according to your emotions. If you always scream and hit them as a form of punishment, they could in turn bite or scratch you as a form of defending themselves. Now we have seen some of the reasons cat bite, we’ll move further to discuss ways to stop your cat from biting. You were having a fun time with your cat, and then a bite or scratch finds its way into your play session you should immediately quit playing with him. Do not reward his bad behavior by petting him, instead walk away or pick him up gently and put him in his crate. Leave him be without interacting with him for a few minutes. Do this every time you play together and soon he’ll start associating bad habit with time out. I think it is glaring already that a veterinarian would be of help in this case. Several cases like my cat keeps biting me for no reason, my cat bite me when I sleep, my cat bites when playing have been reported over the years. To stop your cat from biting you, setting up a meeting with your vet for a complete pet checkup might be the answer you’ve been looking for. He might be ill and since you don’t speak cat language it might be difficult for you to decipher the message he’s trying to pass across. And the only way he can communicate his feelings with you will be by giving you a little bite or scratch. Don’t be quick to judge, instead take him to a professional veterinarian and if the doctor confirms he’s suffering from an illness, a drug will be prescribed to help your furry companion to help him feel better in no time. Your vet might also require that you bring your cat in for regular checkups just to keep track of his progress. I’d say you got it all wrong from the beginning if you’ve been encouraging your feline pal to play with your fingers. As a kitten it might not hurt yet, but as they grow they tend to get used to it causing them to become aggressive. For the cat parents that want to start doing this or that have started already with their little kittens, it is best you stop now. Do not make them think your hand is a special toy they have to play with whenever they feel bored and playful. This could be the reason your cat has become accustomed to biting you or anyone around. Instead, there are varieties of cat toys like the fish pole toy, balls, spring, etc. you can get for him to play with. The bites could leave your hand with lots of unattractive scars and scratches, and in some cases lead to cat bite infection. It’s always advisable to allow your cat have some play time as this might help wear him out. When a cat is full of energy they seem to be over reactive and then biting and scratching becomes a habit for them. Try to wear your cat out by playing with them for a while with their toys, and by doing so they get tired and would want to get some rest. This is a good way to engage their mind and stop them from biting you. It’s imperative you know the right way to react to your cat so they don’t respond by biting or scratching you, friends or family members. Avoid hitting, chasing, or shouting at the cat. Just like when a child does something wrong and you want to scold them without getting them emotionally detached from you. The same principles is applied to cats, you should know how to react to your furry pal so he doesn’t get the wrong signal from you. When you react badly to a cat they get terrified, scared, and confused. It I possible they got the wrong signal thinking you want to attack them, and the next line of action would be to defend themselves. Correct him calmly but with an authoritative tone. It might take longer than expected, but identifying the reason behind your furry companion’s biting habits and following the 5 tips given above will help curb your cat’s biting habit. Ohhh.. I remembery first cat bite like it was yesterday. At first I didn’t believe it was the same cat I was playing with all day and then watching a movie with would actually turn around and bite me. I think I mistakenly put a finger in its ear while stroking its head. This shows that cats are quite sensitive and even if they play with you all day for a long time, the moment you do something they don’t like, they will turn defensive and strike if possible. Too bad I had to learn that the hard way. I’ve really suffered countless cat bites. I love cats a lot and most times when I play with them, I could get carried away and unconsciously do these things I’m not supposed to. I’ve bought some salve to help with the bites to prevent them from getting infected but I always try to watch my actions with the cat to try to reduce the habit. In cases where your cake bites and scratches anything uncontrollably, you either take it back to its family to learn some good manners or you let it stay around other cats to help it adapt to certain things. Or you could just be patient with it and make sure to lovingly correct it when it does that. Teaching it the proper habits won’t be easy but they can learn that. Cat owners should know that cats are very emotional and they can turn defensive or aggressive sometimes when needed. It you are harsh to your cat, especially when he is in a mood to play with you, you can trigger his defensive side and he may come at you to bite or scratch. Don’t hit or roughly push it away even if you don’t want to be close to it. Gently place him in his crate or leave him and walk away quietly. You wouldn’t want to hurt his feelings and have him hurt you physically. True. I noticed that whenever I get a new cat and he gets used to playing with my hands, I end up getting scratched or bitten almost for no reason. Well, I guess I know why that happens. Cats sure love to play and if they get used to your hand, they treat it the same way they do to their toys. I’m always going to keep this in mind. Well, I have not really been lucky with my furry friends even when I let them grow with their family and try to learn some proper habits. I still get the unnecessary scratches and bites. I’ve actually explored all options and no much improvements. I’ll try visiting the veterinary doctor to see if anything can be done about it there. I really love my cats but I don’t like the scratches and bites that comes with trying to play with them. When I finally got my cat to stop scratching and biting, it was a relief. I made rules with it and anytime he wants to play for long, he knows better than to bite me. I started by staying away from it the whole day if it scratches me. Sometimes I’ll only drop his food and leave without any petting. He started to understand that the distant behavior is always there whenever he scratches bites and so he had to reduce it and now it almost in rare cases he does that.